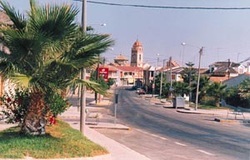 Sucina is a village in Murcia, three minutes drive from Hacienda Riquelme and it is six to eight kilometres from San Javier and near the airport. 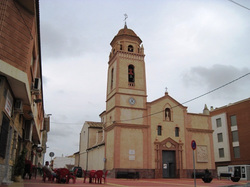 The centre consists of a Roman Catholic church called, ‘Nuestra Señora Del Roasario’ and has been renovated. It is located in a square, flanked by banks, restaurants and bars. Two roads up from the church, along a row of tiny, terraced houses dating back to the 18th Century, is the local ‘Panaderia,’ other wise known as the bakery. ‘Pasteles’ or cakes, are made here too. These are national treasures only to be scoffed as they hold a vital part of Spanish tradition on birthday’s, Saint’s days, Sunday’s. Around the 16th or 17th Century, Murcia’s countryside began to populate and grow, thus Sucina’s appointment being known as ‘El Pozo de Sucina,’ translated as ‘Sucina’s Well’ and also known as Cañada de Sucina - Sucina’s canyons. Produce, such as almonds, olives, wheat, artichokes, green beans, melons, lemons and tomatoes are grown here and exported. These products are the main and fundamental agriculture, aiding the town’s economy. Sucina’s biggest commercial enterprise is the cultivation, transportation and exportation of almonds. Wildlife such as foul and rabbits are scattered about these lands also claiming this region as their own. Tai-Chi, Reiki, Massages, Aromatherapy and much more... A place to meet oneself ... in peace! For more information contact Mario. Original necklaces, earrings, rings, brooches and more. Service at 10.30 am on Sundays. As well as the excellent supermarkets in Sucina, you may also like to visit Dos Mares at San Javier which has Eroski, a large supermarket with not only foods but a wide range of non-food items, including clothes and household items. Dos Mares is a medium-sized indoor shopping centre and is worth a visit.